Pruvan gives you the power to manage your own account, letting you choose the plan that’s best for your business. Pruvan has three standard pricing plans: Basic, Project (Usage) based, and Device based. Below are the pricing and features included with each plan. Perfect for giving Pruvan a try. Unlimited photos and work orders. Free and easy background check-in options. Unlimited photos, videos, and mobile forms on each project. Account balance due at the end of each month. Access to all Pruvan features. Simple, device based pricing lets you actively manage costs. Unlimited photos, videos, mobile forms, AND projects. Account is pre-paid monthly at a pre-set per device rate. Cost is $35 per device per month** with discounts at 5 and 25 devices. Contact us. For detailed information on things like account management, billing, and refunds or cancellations, please read our device subscription policy on our blog. Pruvan is a mobile solution for businesses of any size. If you are a larger organization and would like information regarding our Enterprise solutions and pricing options, visit our Enterprise Pricing page. 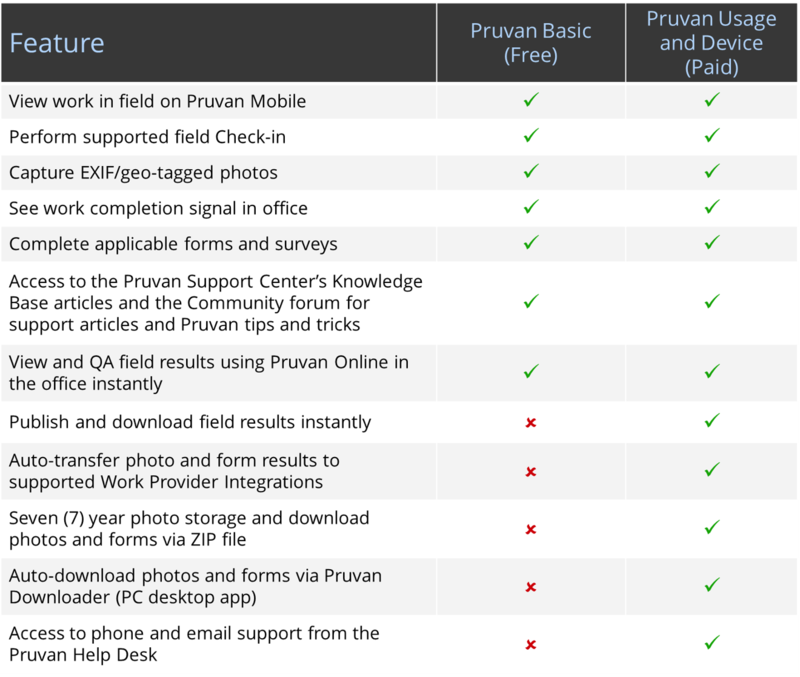 * To learn more about what is and is not included with a free Pruvan account, please review the chart outlined on this graphic. ** As you can see, the more devices you have on your account, the deeper the discount! The regular cost of one (1) device subscription is $35 per month. Once you have five (5) devices on your account, the cost per device subscription is automatically discounted 20% for a total of $28 per device per month. Once you have twenty-five (25) devices on your account, the cost per device subscription is even further discounted to 40% automatically for a total of $21 per device per month. *** Pricing for the Pruvan Project pay-as-you-go plan is $2 per project per business week (Monday – Sunday). You are charged $2 per business week only when there is activity (photos, videos, forms) captured on the project. The spirit of the pay-as-you-go plan is that photos, videos, forms, and tasks are unlimited. However, there is a cap of 5,000 photos and 25 tasks per project. For detailed information on usage based pricing please visit either the blog or the Pruvan Support Center.